Johan Christian Dahl (1788–1857), Burning Windmill at Stege (1856), oil on canvas mounted on cardboard, 68 × 90 cm, Nasjonalgalleriet, Oslo, Norway. Wikimedia Commons. With the Napoleonic Wars concluded, many hoped that Europe could look forward to a period of peace, and its peoples would be spared involvement in battles and their resulting fires. Instead, the nineteenth and early twentieth centuries brought even more devastating fires, many of which were witnessed by artists and committed to canvas. 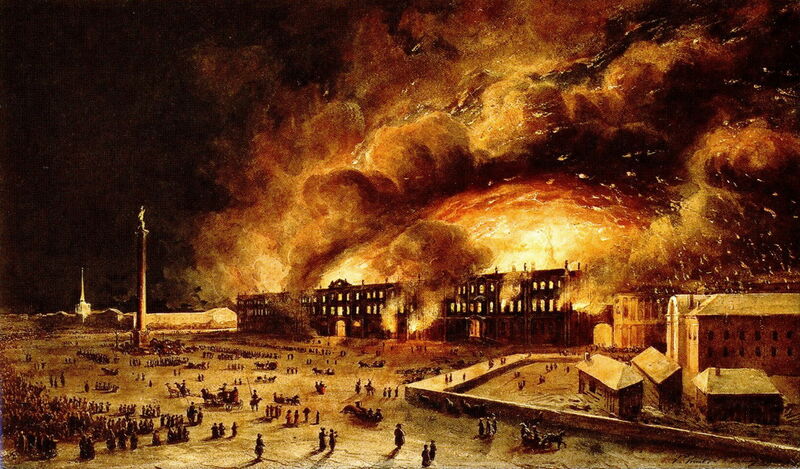 The city of London had seen its last immense fire in 1666 – ‘the Great Fire of London’ – but like many cities was no stranger to more limited destruction. 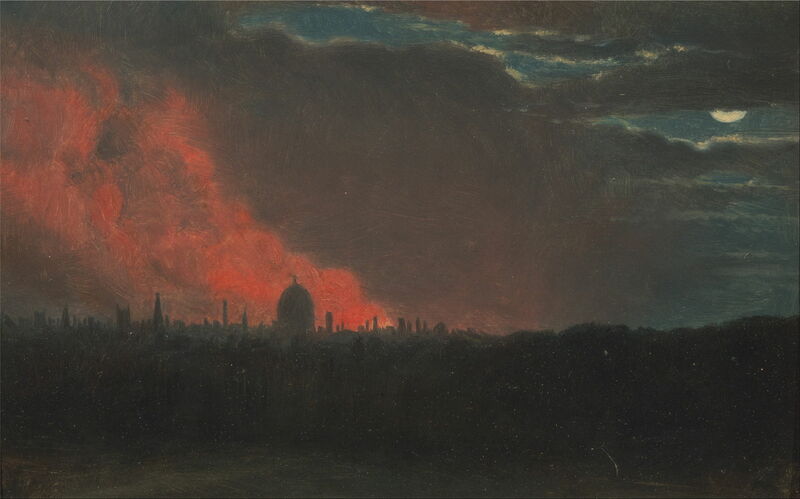 John Constable (1776–1837), Fire in London, Seen from Hampstead (c 1826), oil on paper laid on panel, 9.5 x 15.2 cm, Yale Center for British Art, New Haven, CT. Wikimedia Commons. In about 1826, when he was staying in Hampstead overlooking London, John Constable painted this marvellous oil sketch of Fire in London, Seen from Hampstead. But it was on 16 October 1834 that Constable had his greatest opportunity, when fire completely destroyed the Old Palace of Westminster, the seat of the English parliament at the time. John Constable (1776-1837), Fire Sketch by John Constable, drawn on 16 October 1834, while the Old Palace of Westminster burned (1834), further details not known. Wikimedia Commons. When the old Palace caught fire, most of London turned out to watch the flames. John Constable was in a cab, stuck in a jam on Westminster Bridge, where he painted this Fire Sketch (1834), showing the north end of the building ablaze. He did not, apparently, try to develop it into anything more substantial. JMW Turner (1775–1851), The Burning of the Houses of Lords and Commons, 16th October, 1834 (1834-5), oil on canvas, 92.1 x 123.2 cm, Philadelphia Museum of Art, Philadelphia, PA. Wikimedia Commons. With Constable, his arch-rival, stuck in a cab on Westminster Bridge, JMW Turner was still on the ‘south’ bank, at the far end of that bridge. 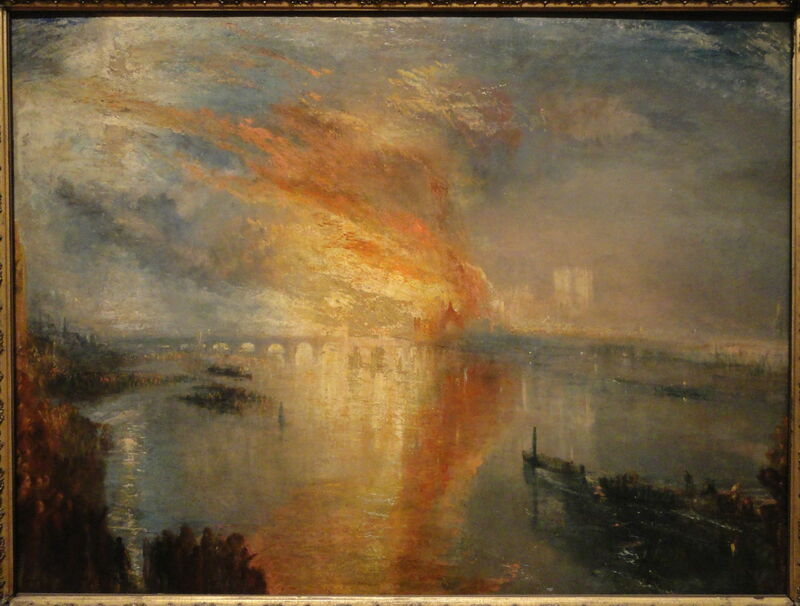 From there, or rather later, he painted one version of The Burning of the Houses of Lords and Commons, 16th October, 1834 (1834-5) in oils, which is now in Philadelphia. The two prominent towers behind the fire are those of Westminster Abbey. 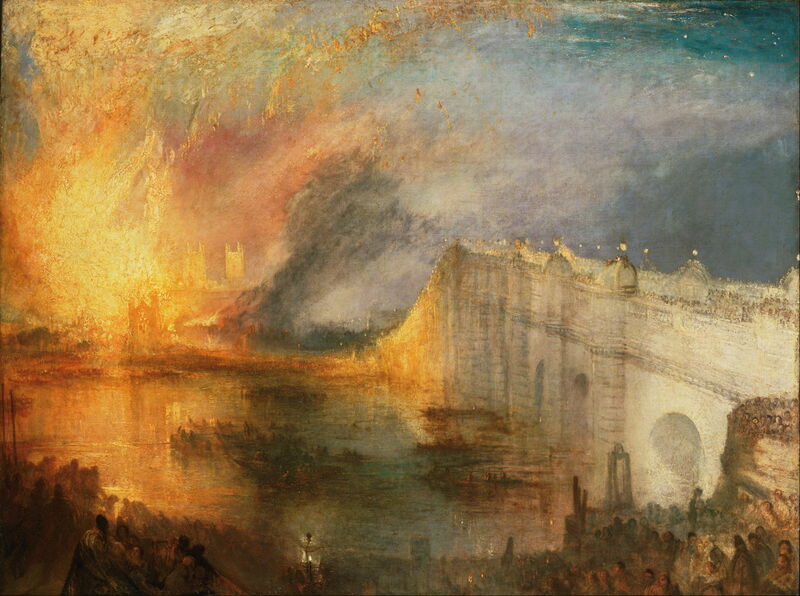 JMW Turner (1775–1851), The Burning of the Houses of Lords and Commons, 16th October, 1834 (1834-5), oil on canvas, 92 x 123.2 cm, Cleveland Museum of Art, Cleveland, OH. Wikimedia Commons. The other canvas shows a view from near what is now Hungerford Bridge, still on the ‘south’ bank of the Thames because of the traffic jam. At that time there was no Hungerford Bridge: the first bridge built at that point in 1845 was a suspension footbridge designed by Isambard Kingdom Brunel, and was replaced with a more massive structure to carry trains to Charing Cross Station, in 1864. In this view, Westminster Bridge is silhouetted against the flames, instead of being lit by them, and the massive towers of Westminster Abbey appear ghostly in the distance. This version is also in the USA, in Cleveland. Turner capitalised successfully on this spectacle, although these paintings were not the atmospheric sketches that they might appear. A lot of the oil paint has been applied wet on dry, showing that Turner must have worked on each for several weeks, at least, in the studio. Pierre Marie Joseph Vernet (1797-1873), Fire in the Winter Palace, 1838 (1838), oil, dimensions not known, Hermitage Museum Государственный Эрмитаж, Saint Petersburg, Russia. Wikimedia Commons. In 1837, the French landscape painter Pierre Marie Joseph Vernet was working in Saint Petersburg, Russia, when the Winter Palace, official residence of the emperor, caught fire. Vernet’s Fire in the Winter Palace, 1837 is a studio painting showing that spectacular event, from observations and sketches made at the time of the fire. 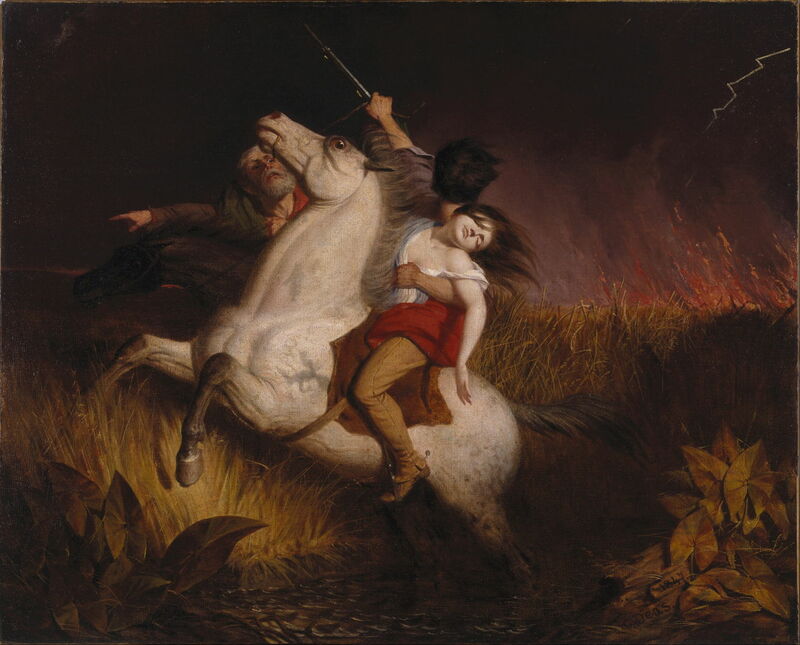 Charles Deas (1818–1867), Prairie on Fire (1847), oil on canvas, dimensions not known, Brooklyn Museum, New York, NY. Wikimedia Commons. It is not only man’s buildings which burn. When dry prairies are struck by lightning, they too can catch alight, and that is the scene which Charles Deas narrates so well in his masterly painting of Prairie on Fire from 1847. A bolt of lightning, at the far right, tells us how the prairie came to be aflame. From this low viewpoint, the fire itself is fairly unimpressive, but is very close behind these three people riding two horses in their flight. On the nearer white horse is a young man, facing behind and away from the viewer, looking back at the fire. His left arm is wrapped around a young woman, who appears to have swooned away. Behind is a black horse, with an older, bearded man in the saddle. He points to the left, exhorting the others to head that way to safety. The tension is produced by implication: that the unimpressive flames at the right represent a much larger and imminently threatening danger, and that it is progressing rapidly to the left, chasing the horses and their riders. 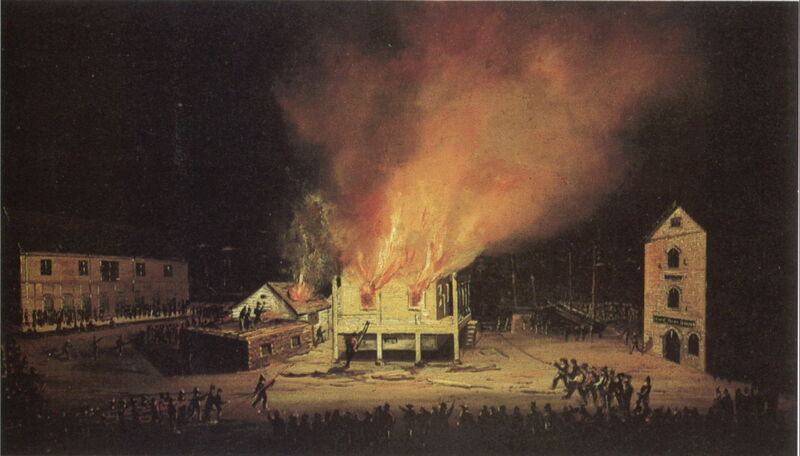 Artist not known, The Burning of the Harbor Master’s House, Honolulu (1852), oil on panel, dimensions not known, Honolulu Museum of Art, Honolulu, HI. Wikimedia Commons. Even when you’re on an idyllic Pacific island, as this anonymous painting of The Burning of the Harbor Master’s House, Honolulu (1852) reminds us, the dangers of fire are never far away. 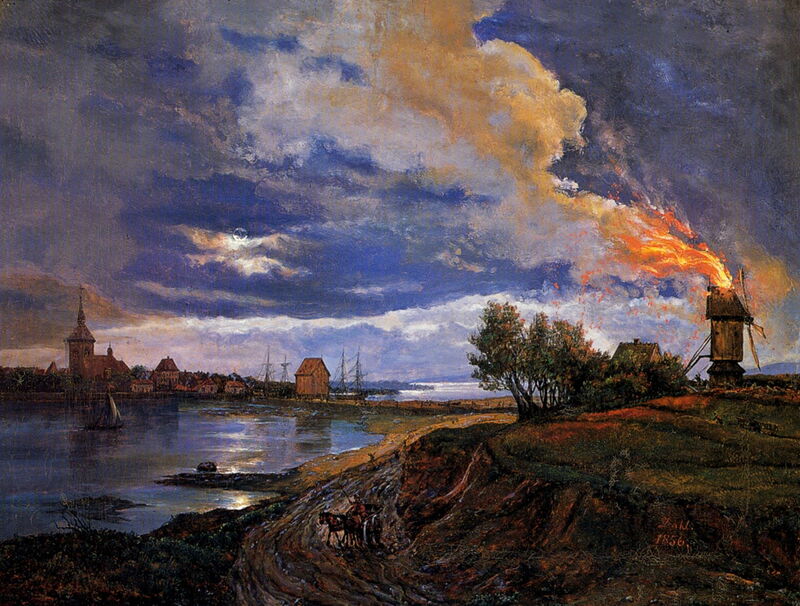 Johan Christian Dahl’s Burning Windmill at Stege (1856) adopts contemporary style and use of colour, but is fundamentally a brandje in the Golden Age tradition of Egbert van der Poel of two centuries earlier. Although painted well before Impressionism, Dahl echoes the red of the flames in the field and trees to the left of the windmill, and even in his signature. 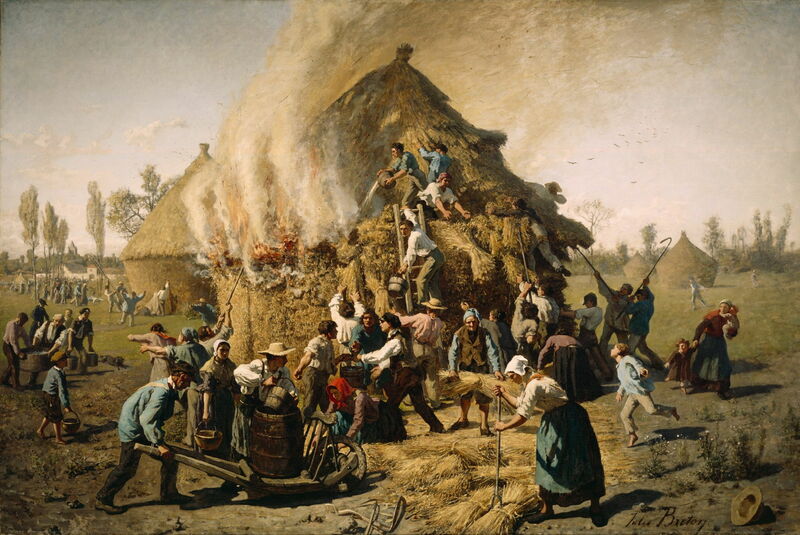 Jules Breton (1827–1906), The Burning Haystack (1856), oil on canvas, 139.7 x 209.6 cm, The Detroit Institute of Art, Detroit, MI. The Athenaeum. Jules Breton’s The Burning Haystack from 1856 shows a very minor blaze, but an important change in the approach to fire. Here the people of Courrières are making frenetic but closely co-ordinated efforts to extinguish a fire which has broken out in one of their grainstacks. Each of its multitude of figures is playing their role as part of the whole, working from an unseen script. During the nineteenth century, organised fire brigades were established in cities, starting with Edinburgh in 1824. My next group of paintings show the devastating fire which struck Frederiksborg Castle, near Hillerød in the north of Sjælland (Zealand), Denmark. Set in a huge deer park, the castle was used as King Frederick VII’s residence during the 1850s. When he was resident on the night of 16 December 1859, the weather was bitterly cold. The king asked for a fire to be lit in a room; because its chimney was being repaired, this allowed the fire to spread. It was so cold that the moat around the castle was frozen, preventing any serious attempts to control the fire, and allowing it to spread quickly to most of the buildings. Thankfully the king’s collection of more than three hundred paintings were saved. 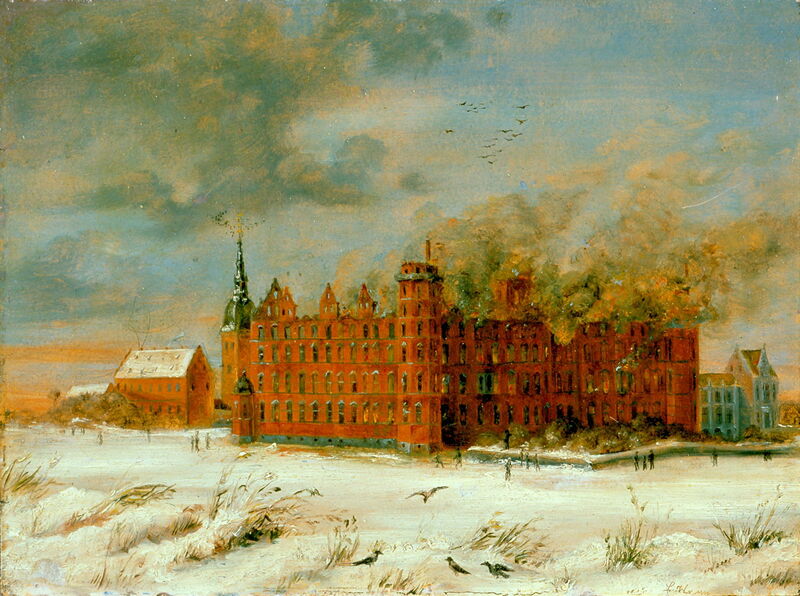 Artist not known, Frederiksborg Castle on Fire 1 (1859), media and dimensions not known, Det Nationalhistoriske Museum på Frederiksborg Slot, Hillerød, Denmark. Wikimedia Commons. This anonymous painting of Frederiksborg Castle on Fire (1859) was probably made in the relative comfort of a studio shortly afterwards. 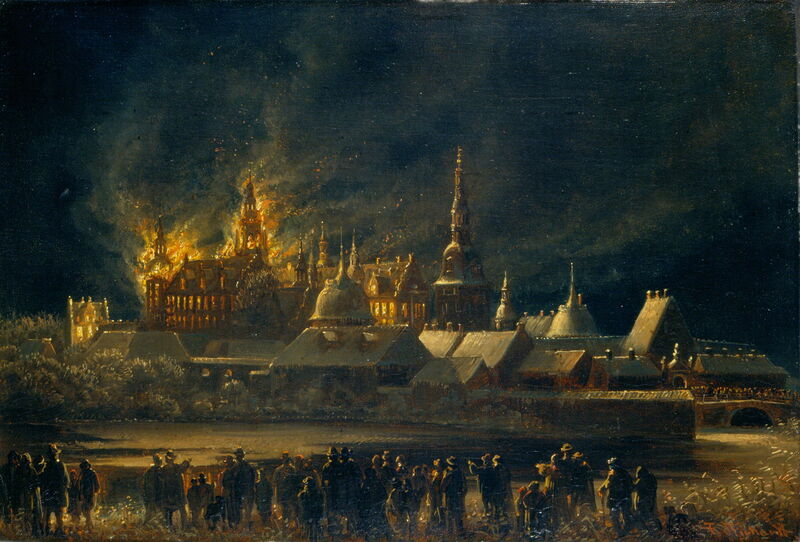 Artist not known, Frederiksborg Castle on Fire 2 (1859), media and dimensions not known, Det Nationalhistoriske Museum på Frederiksborg Slot, Hillerød, Denmark. Wikimedia Commons. 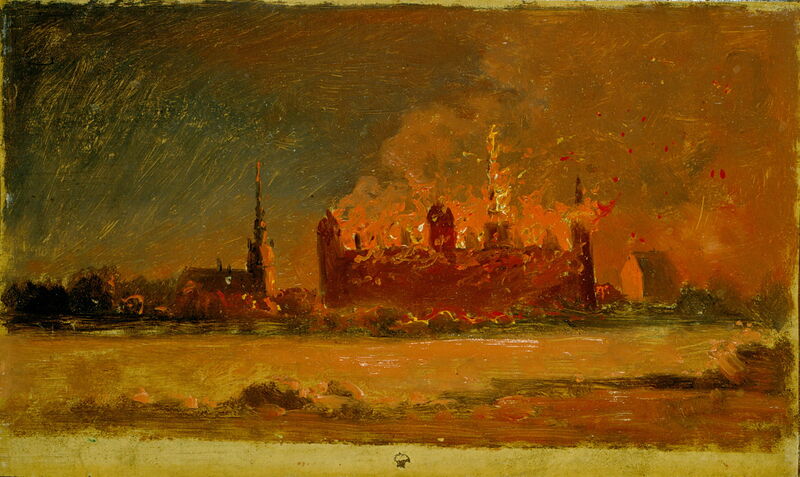 Another anonymous view of Frederiksborg Castle on Fire (1859) appears to be a quick oil sketch made at the height of the fire during that night. Ferdinand Richardt (1819-1895), The Castle on Fire, 1859 (Frederiksborg Castle) (1859), further details not known. Wikimedia Commons. 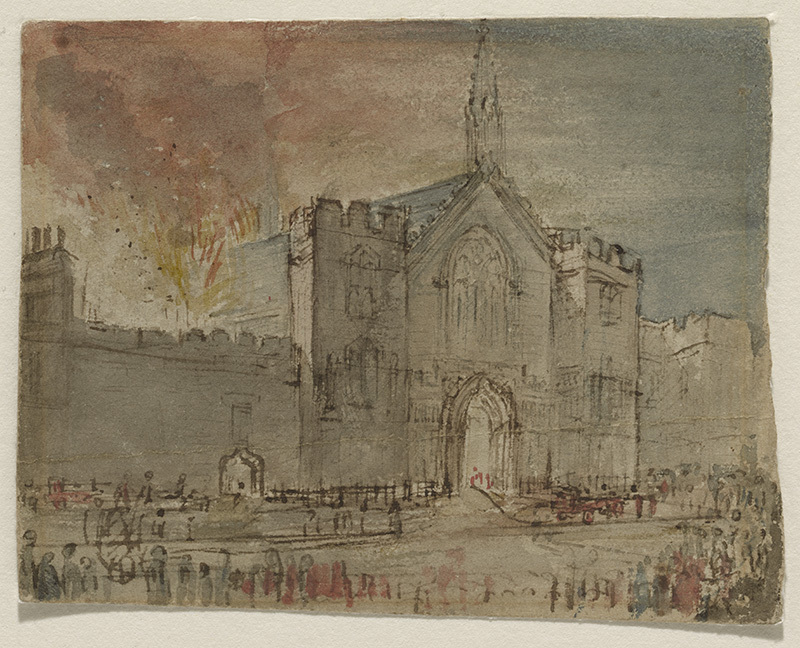 Ferdinand Richardt’s The Castle on Fire, 1859 (1859) was certainly a more protracted work from his studio, but was probably made from sketches and notes at the time. Nikolai Dmitriev-Orenburgsky (1837–1898), Fire in the Village (1885), oil on canvas, 64.5 × 102 cm, Russian Museum Государственный Русский музей, Saint Petersburg, Russia. Wikimedia Commons. 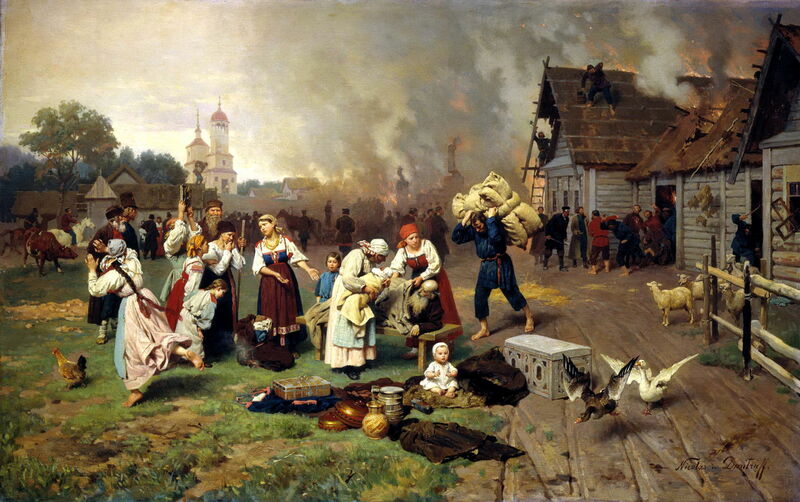 There is no question that Nikolai Dmitriev-Orenburgsky’s detailed realist depiction of Fire in the Village (1885) was painted entirely in the studio. Its emphasis on people and their loss and suffering is characteristic of Naturalism. Most significantly, Dmitriev-Orenburgsky lived and worked in Paris between 1875-85, during the height of Jules Bastien-Lepage’s success; the latter had only died a few months before Dmitriev-Orenburgsky completed this painting. William Coulter (1849-1936), San Francisco Fire (c 1906), oil on canvas, dimensions and location not known. Wikimedia Commons. William A Coulter had been born in Ireland, and travelled to the USA as a seaman. In 1869, he settled in San Francisco, trained in Europe as a marine artist, then from 1896 worked on the art staff of the San Francisco Call newspaper. He witnessed and painted the San Francisco Fire of 1906, which remains his only well-known work. It was clearly made in the studio, presumably from previous observation and sketches. Edvard Munch (1863–1944), The House is Burning! (1927), oil on canvas, dimensions not known, Munchmuseet, Oslo, Norway. Wikimedia Commons. 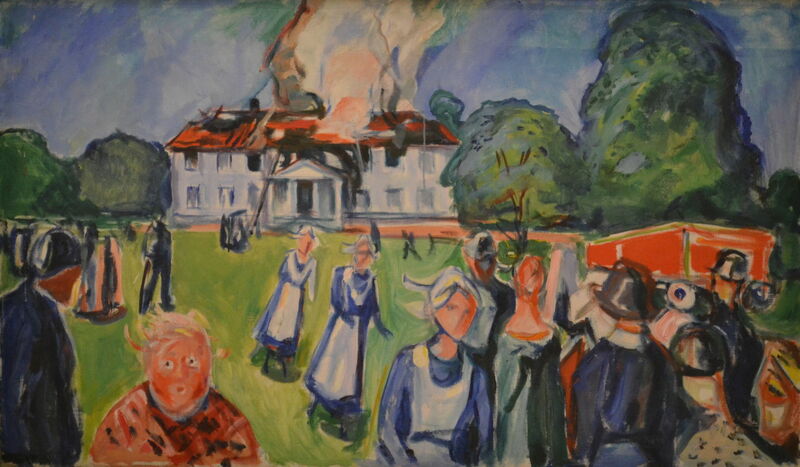 My final painting is one of the best-documented: Edvard Munch’s The House is Burning! from 1927. On the morning of 31 August 1927, the maids working in a manorhouse close to Munch’s studio were using an electric vacuum cleaner when fire broke out in that room. The maids and occupants of the house fled. Munch and other neighbours helped the owners rescue many of their possessions. The local fire brigade attended promptly, and the fire was soon brought under control. Although there have been claims that Munch set his easel up during the fire, this painting is more probably based on a photograph published in a newspaper the following day, carefully recomposed and augmented to heighten its drama. My story has reached modern times: in Munch’s example, with fire brigades, electricity, vacuum cleaners, and photographs. And fire still. Posted in General, Life, Painting and tagged Breton, Constable, Coulter, Dahl, Deas, Dmitriev-Orenburgsky, Munch, naturalism, painting, Richardt, Turner, Vernet. Bookmark the permalink.